Spider-Man meets Animorphs in this thrilling middle grade series from Lisa McMann, New York Times bestselling author of the Unwanteds series. Charlie Wilde knew her life would change forever when her family moved from the city of Chicago to the suburbs of Arizona…and that was before she found the bracelet. After putting it on, she notices odd things start to happen. Suddenly Charlie seems to have the speed of a cheetah and the strength of an elephant—and that’s just the beginning. She would be thrilled about her transformation if she had any idea how to use the device or control her amazing powers. So Charlie is forced to put her trust in new friends to help her uncover the surprising truth behind the mysterious bracelet. 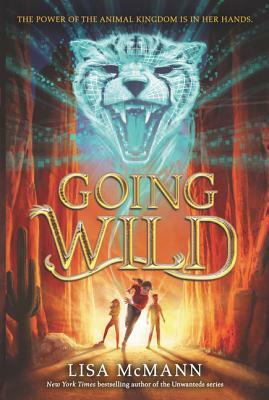 The Going Wild series is perfect for fans of Rick Riordan, Brandon Mull, and Ridley Pearson looking for a new twist on their middle grade adventures. It blends science fiction with the animal kingdom, highlighting some of the incredible feats that animals can achieve, which might seem possible only in comic books but are actually completely true. Don't miss Going Wild #2: Predator vs. Prey and Going Wild #3: Clash of Beasts! Lisa McMann is the New York Times bestselling author of numerous books for kids and teens, including the middle grade dystopian fantasy series The Unwanteds. She lives with her family in Phoenix, Arizona. You can follow Lisa on Twitter and Facebook or visit her at www.lisamcmann.com.